Terry, our barman from Aurora Expeditions Polar Pioneer, on a hilltop above Paradise Harbour in Antarctica. There are many ways to photograph people in the landscape. From an artist's point of view we could break it down into two primary methods: presence and absence. 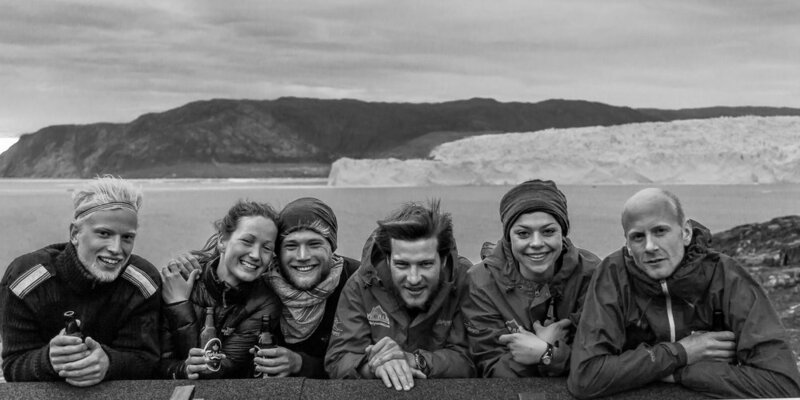 A group portrait of friends at the fantastic Ice Camp Eqi in Greenland with the Eqi Glacier in the background. In the case of the above photo the landscape, though magnificent, is very much playing second fiddle to this group of friends, on the edge of the wilderness, in Greenland. I photographed this likely bunch, in the wee hours of the morning, in front of the magnificent Eqi Glacier in western Greenland. It's often easier to compose uneven (e.g., 3, 5, 7) rather than even groups of people. But, in this case, I was able to bring a sense of order to the image by placing these young folk into two subtle sub groupings. Of the six friends two are female. I placed each of those girls between two guys so as to produce a more balance and cohesive composition. You could say that the guys are framing each of the girls. You can photograph people where the landscape (whether natural, urban or architectural) becomes the background for your photo. Alternatively, you can depict people as they move through that space. That notion works particularly well for certain types of architectural photography. 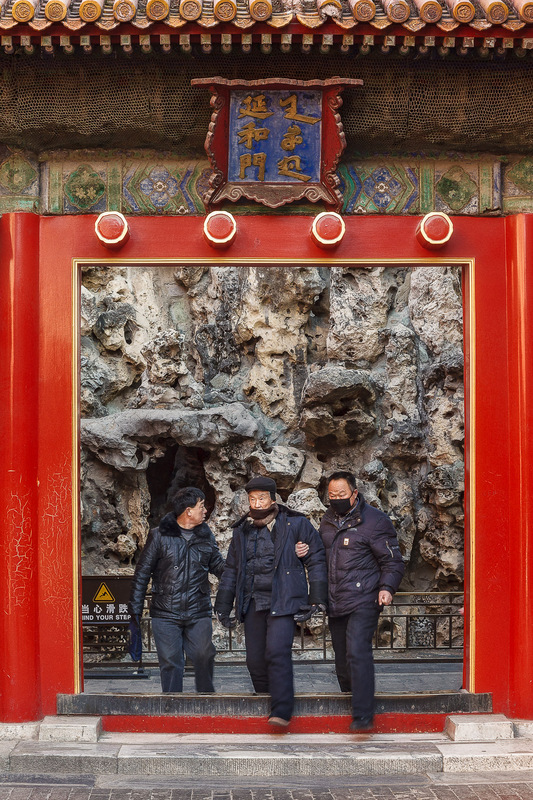 I photographed this candid image of three men moving through a gateway within the grounds of the Forbidden City in Beijing, China. I had noticed these guys moments earlier on the other side of the gateway and ducked back through it so as to make this image with them being framed by the China Red colored gateway. It's interesting to see the relationships between these guys, with one helping the other and with the face masks either present, partly unrolled or fully covering their faces. The fact that the sign in the background says "Mind Your Step" is an extra element that might appeal to folks interested in irony and slightly quirky images. There are no people visible in the above photograph. Yet the surroundings speak to us of the necessity of this shelter for the research scientists who live on site at Port Lockroy in Antarctica. The purpose of the shelter is clear. It's there to protect its occupants from brutal Antarctic weather. It follows, therefore, that you can make a photo about people and the way they live their life without actually showing them in the photo. Likewise, you can make an image that explores the notion of our relationship with the environment through an absence of people. I hope you agree that the notion of absence, when talking about people in landscape photography, is a very interesting concept. The composition of this image is based, not so much around buildings and landscape, but around tonality, shape and texture. Can you see how the near white present in the very brightest areas of foreground snow are tied in with similar areas of brightness on the building's door and window frames, and also in the brightest of the clouds? Connecting foreground, mid ground and background elements within the frame, whether tonally or through the repeating of similar colors, can really enhance the sense of three dimensional space within the image. Similarly notice how the textured areas in the snow connect with areas of similar tonality in the background trees in the image of a tiny snowman on Huangshan (i.e., Yellow Mountain) in China. 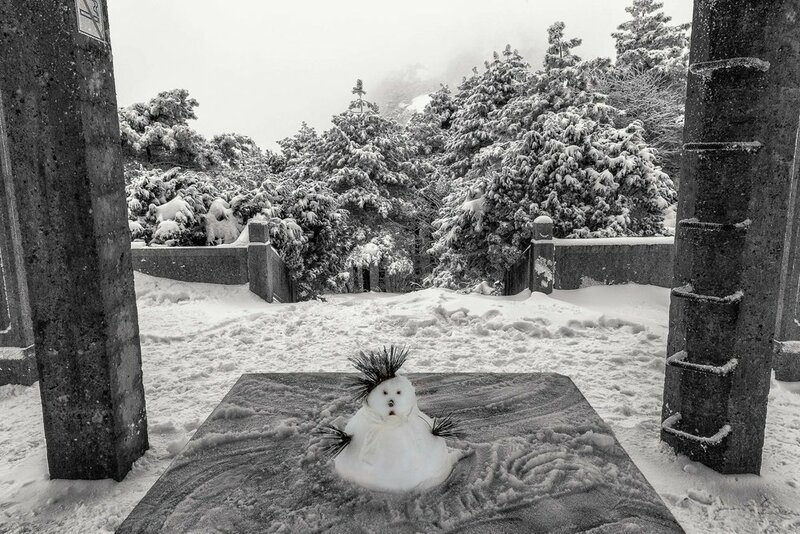 I loved this little snowman and photographed it moments after two local Chinese tourists had created it. The image speaks to us of human interaction with the environment, without actually showing any people. It's another example of how to make a photo that tells the story of people in the landscape through the notion of absence. 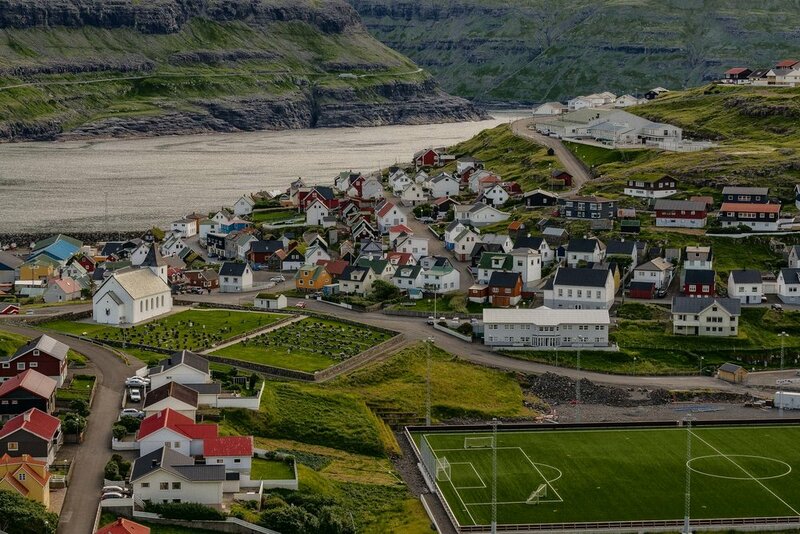 Looking down onto the picturesque village of Eidi at dusk on the island of Eysturoy in the Faroe Islands. So, whether your photographs feature people, buildings or landscapes they are, in a way, all about people. While they may not always feature people directly, many photos refer to our pursuits, ambitions and concerns. What we've done, for better or for worse, and what we leave behind: our legacy. Photography, by it's very nature, documents and preserves the lives of generations. Are you doing enough to contribute to this grand endeavor? If you're new to this site take some time to explore the wealth of resources available to you on the Home page. Similarly, you can learn more about me on this site's About page.